b) I believe discussion is required, as Canadian and especially US News is increasingly "WTF." While dated, it covers the politicization of current news services perfectly. 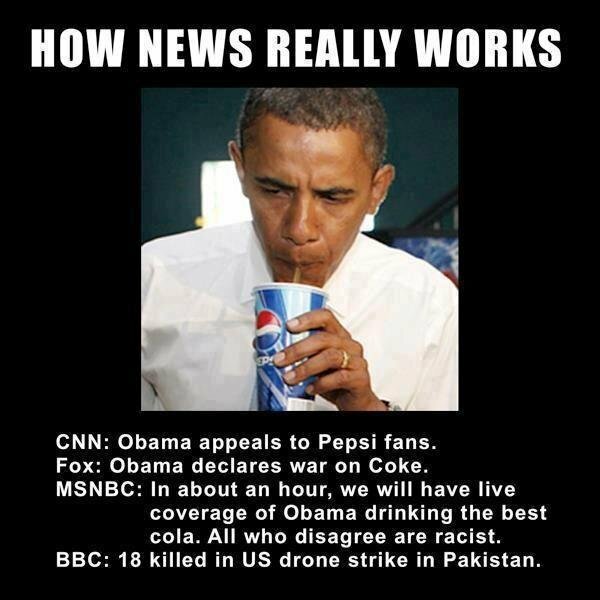 Less and less can one find objective, informative news; it's all about unabashedly biased cheerleading for 'your team.' If anyone wants that, or needs talking points handed to them without having to think through events, there is no shortage of alt-left and alt-right sources out there. Increasingly, if I want news about the US (and to a much lesser extent Canada, because most of the world simply doesn't care about us), I will turn to BBC and Al Jazeera first. Now, while this is currently an irritant, I suspect that there will be a greater knock-on effect in that no one trusting the media lets governments, businesses, etc off the hook from valid and informed public scrutiny as society is increasingly dumbed down. There's obviously no shortage of this happening here within the many, often locked 'discussions' on Trump/Obama, Trudeau/Harper, etc....with all the name-calling of politicians and posters, with a glaring absence of actual informed conversation. Of course YMMV, but I fear our society is f**ked. The Wallstreet Journal is pretty good to, IMO. I still regular go to Fox News, purely for it's entertainment value. The Economist isn't bad, and over its editorial history has fairly equitably supported both Republicans and Democrats of the day. Oh, there are no shortages of useful information sources; IAW the meme, Fox, CNN, and MSNBC just happen to be the worst offenders at pandering to the lowest common denominator. I firmly believe this is a topic worthy of discussion, it cuts to a number of issues that we are seeing debated today. In order for the conversation to be productive, it needs to be held to the same standards with regard to the various news agencies as we are holding posters to with regard to public figures in the political threads. I'm unaware of any point in my lifetime when a print or video news agency didn't have an editorial bias. But. Firstly, a hypothesis I have advanced here before: the increasing polarization and escalation of distasteful tactics is a consequence of the increasing size of the "prize" (power and scope of government). Regulations and programs grow and only rarely shrink with each succeeding legislative term. Secondly: in the internet era, the media are no longer gatekeepers and consequently can not shape public opinion as they were accustomed to. They can not rely on time to blur memories and "disappear" evidence and views they'd rather not see refreshed because almost everything written prior can be (and is) easily referenced in any particular debate. They can't easily move the Overton Window. So they are frustrated; so they start taking short-cuts and resorting to unethical practices to make their points. I don't know whether we should chiefly fault media or politicians. It's clear that increasingly the media actively play offence/defence - incendiary headlines (often imposed by someone other than the article writer); burying inconvenient facts deep in an article or omitting them altogether (favourite example: blaming imminent inundation on sea level rise on the order of 2-3 mm per year, and later in the article commenting almost in passing on land subsidence on the order of several cm per year due to poor water table management); "talking-points journalism" masquerading as "explanatory journalism" ("All You Need to Know About X"; "X, Explained"; "The 10 Most Important Things About X"; etc). On a handful of important issues, media have damaged their credibility by resorting to the "fake-but-accurate" defence. But there is also the political manoeuvring to "sell" policies and legislation. The deceptions and deals to pass the PPACA in the US were ugly, as were the press manipulations supporting the Iran deal. Then later a couple of the principals admitted to relying on the gullibility of the public and the press. I think Ben Rhodes's bragging about press manipulation did more damage to the institution than any number of Trump's ham-fisted insults/attacks. A few times, journalists were caught soliciting the approval of political operatives prior to publishing: more damage to credibility. The Society of Professional Journalists (US) has a Code of Ethics. Journalists would have to start by strongly following the Code to reassert their usefulness. They can not only be 90% or 95% compliant: "Your denial of the importance of objectivity amounts to announcing your intention to lie to us. No-one should believe anything you say." - John McCarthy. I think to call this a media issue in the general sense is wrong. There has been a split within the media-often within a single company-of presenting either hard news, opinion pieces (called opinion-tainment) or a combination of the two. I find that I can still get good hard news from such US sources as ABC News and CBS News and even CNN. Fox and MNBC muddy the water entirely too much and it's harder to glean facts from the mush. I'm not sure if the press was ever pure. When you read articles from the Revolutionary War or the Civil War you find things that will make you cringe with how inaccurate, partisan and highly loaded with misinformation they were. There has always been and always will be a need for readers to use common sense when reading a news article. While there has been a gatekeeping function in the past to keep the press honest through the National NewsMedia Council in Canada and the FCC for broadcast journalism, those agencies are weak and have no jurisdiction over much of what passes for journalism or opinion pieces these days. Hate to bring up an old bug-bear of mine but I think religion plays a large part in creating the polarizing differences between us and the tendency to believe opinion pieces that have little basis in fact or reality. When one unhesitatingly accepts "faith" in a dogma that cannot be logically proven (and often has considerable evidence to disprove it) then one becomes susceptible to other ideas, regardless of how logical or illogical they are, as long as they are disseminated by a "trusted" source. These last few decades have created an explosion of media channels that are unregulated, ill informed and sometimes destructive (Goop or Kardashians anyone?). We'll never get the genie back in the lamp. It's a massive flaw within the concept of democracy as we know it. At best we can try to restrict outside influences but we'll never be able to bring back a feeling of unity unless we are faced with an external threat so massive that everyone can agree to oppose it. Apparently Russians hacking your political parties and causing mass misinformation campaigns isn't a big enough problem. I don't think that bias is as much the problem. I think that the real problem is that many of the major players attempt to wrap themselves in the cloak of impartiality, when nothing could be further from the truth. People can accept bias when it's stated up front, but once trust is lost, it's generally lost forever. This is were the MSM is losing their way. I always found this chart somewhat useful. This, we agree on as I just did this exact thing on the weekend. It's interesting to me that while I have substantial ground to quibble with you over the definition, consequences, and function of religion, you are not entirely wrong about it being inherently polarizing. After all, one of the earliest functions of religious belief (going back to the pre-Abrahamic traditions) was to foster a communal sense of identity and purpose. One could argue that what we now call identity politics is a mutation of something we've had with us since before we learned how to make pottery. I agree that there are a number of good hard news sources remaining in the US, but I find that it's still beneficial to pay attention to the more biased sources. If you do not know how those you disagree with understand the same events, you quickly lose track of many other things about them. There's a reason why when I pay attention to political commentary, I'm very careful to maintain a 2:1 ration in favour of the perspectives I disagree with. Interestingly enough, who falls on what side depends on the particular subject, as it should be. YouTube has created a tremendous change in the observed rules of this theatre, but it certainly doesn't take away from the need for both healthy skepticism and rhetoric in schools. I"m horrified to realize that what I learned about persuasive communication in high school was not at all accurate when compared to what I learned in college. There are five generations of teachers in my family, and having looked at what my great-grandmother taught her student 80 years ago, there is absolutely no question in my mind that we've stripped away far too much of what students truly need to know. A joke from my marketing program was that the reason why advertising exploded across every form in media after WWII was that everyone who worked in psychological warfare would've been out of a job otherwise. I don't rightly know how true that is, but it's uncomfortably reasonable. People are not being "dumbed down" by their news outlet of choice. But they are becoming more intolerant. There is more than one way to look at things, there is no absolute black and white. People are not being "dumbed down" by their news outlet of choice. Look at the chart provided by Infanteer; Fox 'News' falls into the rectangle labelled "nonsense damaging to public discourse." If Fox is someone's only, or even primary, source of news, how can it not be dumbing? The chart is not authoritative, and disproves its own reliability. It shows Daily Kos "above" Fox News, which is absurd. Media bias estimates, like "fact checks", should be taken with a large grain of salt. Using the Pew survey results I linked earlier, you can apply your own judgement/correction to the chart. 1) The survey shows an increase over time in the polarization gap between the median Democrat frame of reference ("D") and the median Republican frame of reference ("R"). 2) The evaluation of "neutral" depends on frame of reference, and one of the frames has a much greater "velocity". From D, it looks like Republicans are becoming more extreme. From R, it looks like Democrats are becoming more extreme. From the survey animation, it is clear that the net shift is overwhelmingly due to the movement of D leftward. Furthermore, if Republicans (conservatives) were truly becoming more extreme (commonly cited myth among left-leaners), it prompts the question "compared to what/when"? Are Republicans more conservative now than during the Reagan era? The Eisenhower era? Common sense suggests that on a host of issues (tolerance of divorce, acceptance of single parent and other non-traditional families, acceptance of homosexuals open in public life, tolerance of other cultures, publicly-funded health insurance/care, etc), conservatives are also moving leftward over the long term. 3) X-axis: The chart's x-axis assignments are not static. Because of the increasing polarization gap, an information source anchored to the political centre would, over time, be perceived as rightward drifting seen from D, and leftward drifting seen from R. If complaints about the perceived bias of a source are one-sided, it suggests the source is moving along with whichever frame (D or R) tends to think the source is "neutral". NPR, WaPo, NYT, and Guardian are examples of sources which have long been accused by the right of left-leaning bias which should properly have them positioned well into the "skews liberal" zone. The handful of times I have read of an organization like NYT being accused of leaning right, it has been from someone occupying a position well to the political left (way out past Sanders Democrats). 4) Y-Axis: The categories rated as "Complex Analysis" or "Analysis" deserve to be positioned above "Fact Reporting" and "Original Fact Reporting". Analysis - even partisan analysis - is more accurate (more time to assess events and sift evidence; more deliberative and less reactive to immediate events). Importantly, the writers for "analysis" organizations spend a fair amount of time responding to each other, highlighting errors and omissions. I don't find the wire services and major "fact" media all that reliable when it comes to accurately reporting "facts", and most act as information gatekeepers, which militates against their being slotted in the "neutral" column. (You can see it when organizations on one "side" are seized with an issue of the day, and barely a peep emits from organizations on the other "side".) Broadcast media convey almost no useful information at all in the time available; I find them to be a waste of time. I believed the chart was flawed, but Brad layed it out. So if one is basing their opinion on flawed data, does that not make the opinion flawed also? There are several factors affecting journalism, the loss of ad revenue drive most of them. Small staff, meaning less research, the loss of inhouse archives, shorter deadlines. Individuals not comprehending that they have a bias and a general drifting to the left of centre by most news staff. This is a major issue, not so much the bias, but the inability to comprehend that it exists, yet a belief they are being impartial. That drives the loss of respect and trust. Fox is generally aware they are right of centre and don't hide it, making them a bit higher on the honesty scale, they to suffer from structural issues as well. Part of the problem today is not finding information, but being able to shift through all of it in time to meet the deadline and be able to detect misinformation. Even a diligent reporter holds little sway over their editor, who can change the thrust of an article to fit space available and make it more marketable. At the end of the day, media is a business and bringing in revenue is the primary goal. Ergo, personal opinion on a subject is an acceptable form of discourse to use during a discussion. I have said, too many times perhaps, that I expect the media to be biased ... how can it not be? It is the creation of human beings and we, each of us, has a whole hockey sock full of opinions and prejudices and so on. I like it best when, as in e.g. The Economist and the Financial Times and, yes, the Toronto Star, the bias is up front and stated ... I understand, for example, the Star's 'Atkinson Principles' and I am not shocked when it tries to live up to them. I wish TV news had named, publicized editors and publishers like the printed broadsheets, tabloids and news magazines do and I wish we had more proprietors like Conrad Black who were not shy about announcing (and enforcing) their biases. Good newspapers (and good TV news ~ what's left of it) try to ensure that they present "contrary" views ~ contrary to the proprietor's/publisher's point of view ~ it's the balance thing and they do it because it keeps them on the ball. Poor newspapers and most TV outlets allow, even encourage "shouting matches" between partisans of different views, but they are rarely informative. I take ALL media with a grain of salt ... I subscribe to one Canadian newspaper, two global ones (one daily, one weekly) and one regional (Hong Kong) one, all of which have biases that I think (I hope) I understand. The chart is not authoritative, and disproves its own reliability. Of course the chart is not authoritative. I said it was useful, not that it was "The TruthTM". It puts everything on a fair attempt at a spectrum and gives one a starting point to start asking the two most important questions any reader can ask after reading something - "Who is the person [or what is the organization] that wrote this?" and "Why are they saying what they are saying?" ….gives one a starting point to start asking the two most important questions any reader can ask after reading something - "Who is the person [or what is the organization] that wrote this?" and "Why are they saying what they are saying?" Presuming that the reader cares any deeper than, "this reaffirms what I already believe, hence why I need no other news sources." As for any claim of the media bias chart itself being authoritative, I concur with Infanteer that it cannot be. I also acknowledge the results of Pew Research's "Polarization in American politics," in that there is an undeniable left- or right-Point of View in how we are predisposed to see events. This shouldn't negate thinking through the potential biases to get a more complete understanding of issues, or how others may see them. - Select a big political story, so nearly everyone covered it (easier to compare bias when sources are covering the same story). - As a result, it is easier to tell when an article is omitting facts. - It is also easier to compare how even highly factual stories characterize particular facts creating a partisan lean. - Where both long and short versions exist, comparison shows facts that are omitted in framing the issues one way or another. So while the bias chart may not be iron-clad, it is an ongoing work in progress (I'm looking forward to her refining views on al-Jazeera for it's re-inclusion, since it's one of my international news 'go-to' sites), which provides some utility for those willing to consider it.